We believe people of all abilities should live meaningful, fulfilled lives. Transitions provides an array of services to assist people, who have an intellectual/developmental disability, and their families. Our services for those, who have an intellectual/developmental disability, promote independence and self-sufficiency and enable those, who have an intellectual/developmental disability, to live meaningful lives in their community. We believe adults, who have an intellectual/developmental disability, should live meaningful and active lives. New Horizons Community Day Services provide wonderful opportunities for adults who have an intellectual/developmental disability. 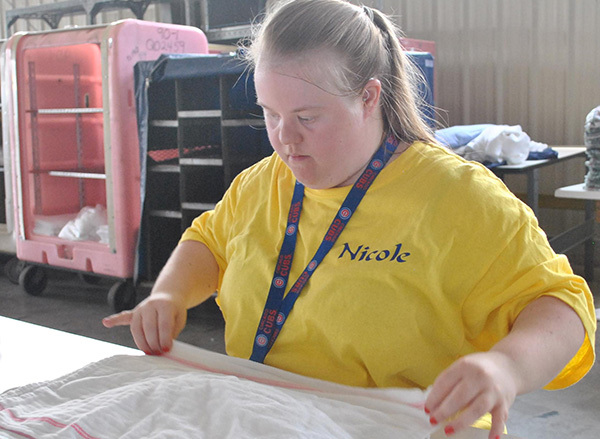 Through participation in educational groups in the program and outings in the community, adults, who have an intellectual/developmental disability, learn social skills, skills of independent living, and recreational/leisure skills. Vocational services are also provided. For those who are not ready for community employment, trainees can learn work skills, which can lead to employment, by completing meaningful work for area businesses and by volunteering their time to many worthy causes in our community. New Horizons Community Day Services are also available to consumers who have severe/profound intellectual/ developmental disabilities. Our staff are able to meet the specialized needs of those with more severe disabilities. We provide supportive services to those with an intellectual/developmental disability and their families. By providing intermittent supportive services, adults with an intellectual/developmental disability are able to live successfully in the community. Referral to and coordination with healthcare providers, financial resources, and other social services ensure that those, who have an intellectual/developmental disability, have access to needed services. Questions about intellectual/developmental disabilities (DD) services can be directed to the Director of Intellectual/Developmental Disabilities Services at (217) 224-2194.